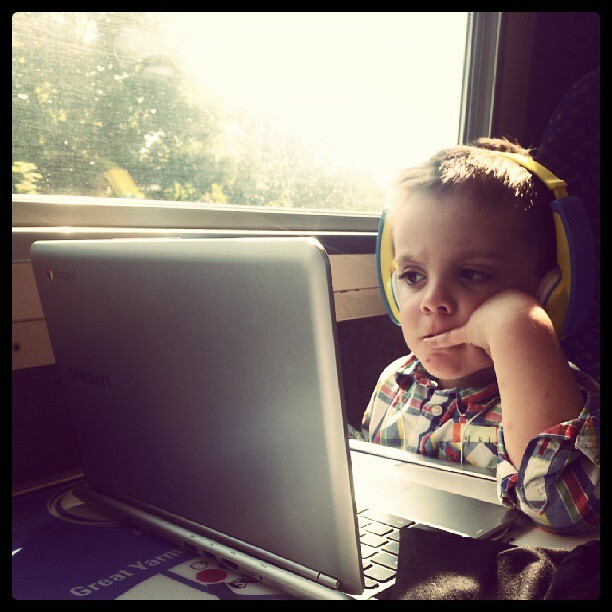 At the weekend I spent some time observing my eldest child Oscar try to navigate his way around the CBeebies website on a computer with mouse and keyboard. It was a painful experience. The touchpad on the laptop (a Samsung Chromebook) was beyond his comprehension and dexterity. The full-sized mouse cumbersome and his little fingers kept slipping over to the right-hand side with the inevitable clicking issues. The content itself (http://www.bbc.co.uk/CBeebies) is a mish-mash of icons, words, Flash games and video content, and that combination left him confused on occasion, but not as often as shifting mouse focus away from the main content area of the screen, leading to the page scrolling away from him. And that was nothing in comparison to the points at which the games themselves decided to opt for keyboard rather than mouse control (usually cursor keys or the space bar). Oscar is a touchscreen kid. Put him on a tablet or phone, and he can navigate his way around without distraction – as can his 13-month younger brother (Oscar is four in November). The abstraction that the keyboard and mouse places between him and using things is surmountable, but very, very obvious. I tweeted about this over the weekend, and there was something of a debate. It split roughly between “Touchscreens are where it is at” and “Touchscreens are only any good for content consumption”. And I’m old enough to remember when Mice were still a new idea and that many serious computer folk saw them as a gimmick. In fact, I’d reckon that similar conversations went at the time of the introduction of punch cards, and also when the keyboard first rose to prominence as a user interface device. To this day there are many folk I know that prefer the keyboard to the mouse and one of the bizarre side-effects of using Windows 8 was that I found myself, when in desktop mode, using the keyboard more and more (Windows Key-> Type the name of the app I needed-> press return to launch it”). I’ve no doubt that mice and keyboards will be with us for quite some time to come. We still, of course, have the command line (for example). But the nature of touchscreen devices means two important things from where I see things: firstly that they are so much easier to use at a basic level that they will kill the WIMP (Windows, Icon, Mouse, Pointer) model that we’ve had since the late 1980s; secondly, that touchscreens and smart devices are changing the types of applications that we use so that we will no longer need the keyboard and mouse. For example: after a family day, five years ago I may have emailed a few friends and family to let them know about it. Or uploaded a few photos and plopped them onto Flickr. These days I’m sharing photos via Instagram and Facebook as I am out. A few words maybe attached, but remember the adage of a picture telling a thousand. Five years ago I may have used an Instant message client or email to communicate with business contacts. These days I fire up a Skype or Google Hangout session to speak by audio or video link. The new devices, plus increasing power and connectivity, means that the types of communications we are using are moving away from the ways in which the old technologies and interfaces constrained us. The QWERTY keyboard and the mouse, whilst deeply embedded into the way in which we do things today, aren’t a wonderful thing – they’re the way in which we’ve learned to accommodate poor user interface experiences into our current digital lifestyles. “Content creation” isn’t limited to text or things that can be clicked and dragged about with a mouse. And I’m certain that in the years I’ve been using smartphones I have created more content (in the form of photos and videos) than I have on the sum total of computing devices that I have ever owned previously. Previous Previous post: Transparent tablets? Really? !